McRae Imaging has spent over fifty years innovating the connection between art and science through the combination of light, color, and design. We strive to find the perfect balance of all these aspects to create uniquely stunning imagery that truly reflects our clients’ brands. The results we achieve with our one of a kind approach creates lasting customer impact that can’t be found anywhere. With the retail world constantly changing, it is important for us, as visual imaging experts, to always stay updated on the recent trends. The McRae Customisation Team can transform virtually any concept into the real deal. Whether it be store windows, feature walls, installation ceilings, shelf signage, and/or hero merchandising, we can elevate anything to a pristine art form. One of the growing trends we have seen is using the ceiling as an additional space to interact and engage with the customer. Lighting has an overall impact on the store’s ambiance. If the space you are working with is dark or you want to bring an open light space, putting a skylight into the mix could be a great option. Simple PopUp stores with one impactful ceiling lightbox as a feature can really make the store pop! Why Consider McRae for this project type? There are lots of folks that make lightboxes however one of our difference is our in-house expertise on lighting and the machines we have invested in to get the best lighting outcomes. For example, with a high-profile client, we built large skylight looking fabric lightboxes. The design agency gave McRae the design specs with certain light intensity and brightness for the skylights. The request was for the “skylights” to look like broad daylight. We built the lightboxes as requested and installed the lightboxes into their space. The VP project lead loved the look but felt like he was more of a “cocktail hour” kind of guy. We took this feedback, went back to the shop, did all the light measurements necessary to give this effect for the store. We built the lights in-house to the new specifications and installed the new lights for the “cocktail hour effect” within a week. This is not possible for most lightbox companies because we are able to test, create and then build the lights all in-house with little import requirements. Be innovative when it comes to incorporating your ceiling into another area of design. Do not be afraid to step out of the box because being bold can be just what your store needs to draw in customers. As your lightbox creators, we can transform any vision you might have, whether you want to create a crisper finish in a room, use the space for advertisement, or make a bold statement, we can help you. Working in the retail industry means we understand how important it is to create the perfect customer experience in your store. Everything is made to last and we ensure the high-end quality of all our products. As your imagery and fabric lightbox company, we can ensure the best products on the market. 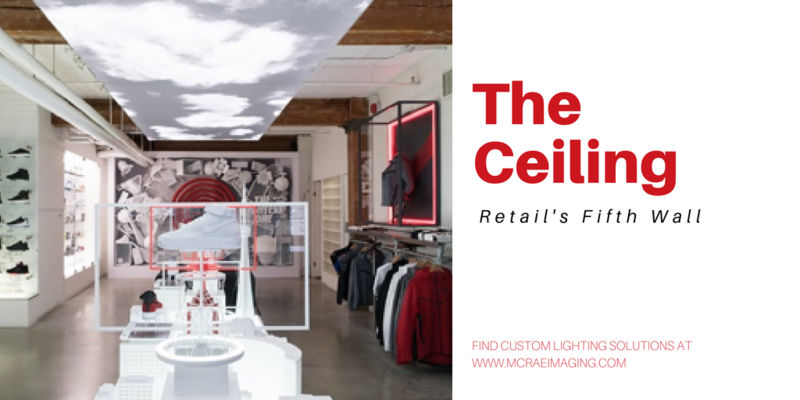 For inquiries, please call the McRae Imaging office at 905-569-1605 or check out some of our ceiling projects in our gallery.